Men love birds and create boxes !!! 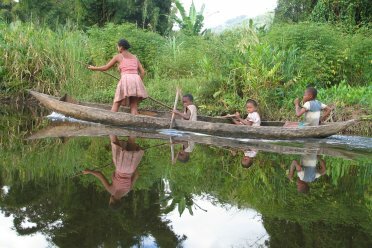 Since a few years, Madagascar has become a privileged destination in ecotourism and wildlife. 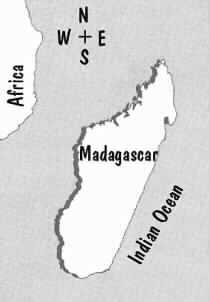 Madagascar, an enchanting island, an authentic country, which will please you for its diversity and for its welcoming people. Madagascar, one of the best destination in the world for discovery tour lovers and for trekking tour lovers. Madagascar, a destination off the beaten tracks. Quantitatively the bird found in Madagascar is not as rich as those in other countries, but the difference is in its endemicity ( about 110 species ). The most favorable period for observation goes from september to november. The easiest because of infrastructure facilities are ANDASIBE PERINET - MANTADIA National Parks and RANOMAFANA National Park. The both occur on montane rainforest and on mid-altitude rainforest. You can see there for examples : the Cryptic Warbler, Rufous-headed Ground-roller, Madagascar Yellowbrow, Grey-crowned Greenbul, Brown Emutail, etc. It's easy too to find them at IFATY, AMPIJOROA - ANKARAFANTSIKA, ZOMBITSE and ANDOHAHELA National Parks which occur on southern or western deciduous dry forest. Sometimes it's a spiny forest ( characterised by the cactus-like trees and the Didierea trees ). And sometimes, it's a fairly dense seasonally dry forest where it's difficult to penetrate. You can see there for examples : the Thamnornis Warbler, Subdesert Brush-Warbler, Subdesert Mesite, Verreaux's Coua, Running Coua, Lafresnaye's Vanga, Red-shouldered Vanga, Littoral Rock Thrush, etc. Or the Red-capped and Giant Couas, Coquerel's Coua, Sakalava Weaver, Appert's Greenbul, White-breasted Mesite, Sicklebilled Vanga, Van Dam's Vanga, etc. Then you can too observe birds but more difficult beacuse of lack of infrastructure in these following regions : the lowland eastern evergreen humid forest such as MAROJEJY and MASOALA National Parks, and the West wetlands or the East wetlands ( the rivers, the lakes & the marshes of AMBOROMALANDY LAKE, IHOTRY LAKE, TSIMANAMPETSOTSA LAKE, KINKONY LAKE, ANTSALOVA, BETSIBOKA etc. or at VOHIPARARA, TOROTOROFOTSY and ALAOTRA LAKE ). 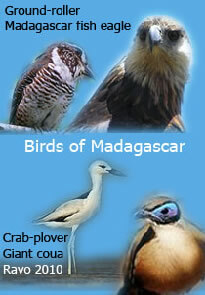 You can see there for examples ( at West ) : the Sakalava Rail, Great-billed Heron, Humblot's Heron, Madagascar Teal etc. And at East : the Madagascar Rail, Madagascar Snipe, Madagascar Pochard, Madagascar Little Grebe, Meller's Duck, Yellow-billed Stork, Common Stonechat, etc. 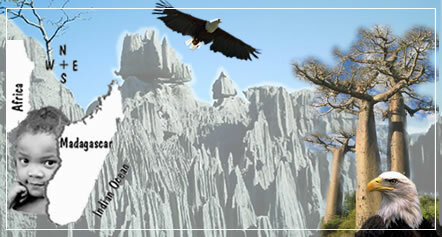 Natural cathedrals, vast eroded karst pinnacles, crevices, grottoes & 360° viewpoint. To discover & to watch lemurs such as Sifaka lemur & many species of birds such as Madagascar Fish-Eagle (Haliaeetus vociferoides), Greater Flamingo (Phoenicopterus ruber), Madagascar Teal (Anas bernieri), White-faced whistling Duck (Dendrocygna viduata), Knob-billed Duck (Sarkidiornis melanotos), Madagascar Hoopoe (Upupa marginata), Cuckoo-Roller (Leptosomus discolor), Madagascar sacred Ibis (Threskiornis bernieri), Madagascar Paradise Flycatcher (Terpsiphone mutata), Madagascar Coucal (Centropus toulou), Madagascar Bee-eater (Merops superciliosus), Madagascar Kingfisher (Corythornis vintsioïdes), Madagascar Harrier-Hawk (Polyboroides radiatus), Madagascar Kestrel (Falco newtoni), Yellow-billed Kite (Milvus aegyptius), Gray-headed Lovebird (Agapornis cana), Greater & Lesser Vasa Parrot (Coracopsis vasa & Coracopsis nigra), Crested Drongo (Dicrurus forficatus), Egret species & Heron species, Humblot Heron (Ardea humbloti), Hamerkop (Scopus umbretta), etc. . 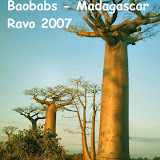 This trip can be combined with the South-West of Madagascar to continue to explore Baobabs or with the Masoala National Park for a contrast ( Masoala National Park is a paradise pristine evergreen humid forest in Madagascar ). Your own tent, pegs, mattress, sleeping bags ; anti-mosquito spray and cream, pocket torch and spare batteries, head torch if possible, swimsuits, light clothes, but also some warm clothes for the highlands, cameras, small padlocks for your luggage ; your personal medicines such as general antibiotics, anti-diarrhoea, antiseptics, e,g, Betadine, compresses and cotton, ointment for sprains, lip cream or gel ; protect yourself against malaria, e.g. follow a treatment. Sun cream ; sun glasses, walking shoes or closed sports shoes, plastic sandals to walk through streams, binoculars if necessary, old clothes ( children’s and adults’ ) to give here and there during the trip ( also biros, colour pencils, old dolls, teddy-bears, small balloons, etc. ) ; Swiss knife, k-way or windcheater, hat or cap, toilet paper, cigarette lighter to burn toilet paper, etc. AND cash money = Euros.